Amateur astronomer Michael Jager of Stixendorf, Austria, photographed the new Comet McNaught C/2009 R1 on June 6, 2010, while the comet was visible to the naked eye in the northeastern morning sky. Comet McNaught will pass closest to the sun (perihelion) on July 2, 2010, at a distance of 37 million miles (60 million km). Space.com: “Comet McNaught (C/2009 R1) is now just barely visible to the naked eye in the predawn, northeastern sky from the Northern Hemisphere. This map shows the sky as of June 9 2010, just before daybreak. 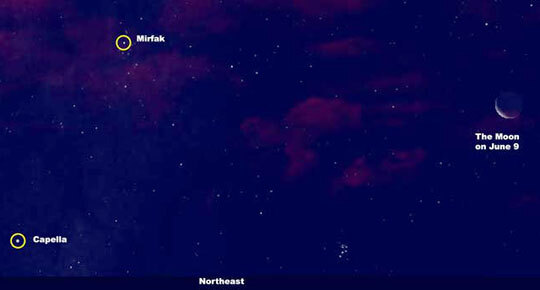 The comet will be near the star Mirfak on June 13-14, and brighter than now. Sliding lower each morning, Comet McNaught will reach 3rd magnitude near the star Capella on June 21-22.” Sky map © 2010 by Space.com. June 11, 2010 Stony Littleton Long Barrow near Wellow, Somerset, England - Last September 2009, a new comet was discovered by Australian astronomer Robert McNaught. 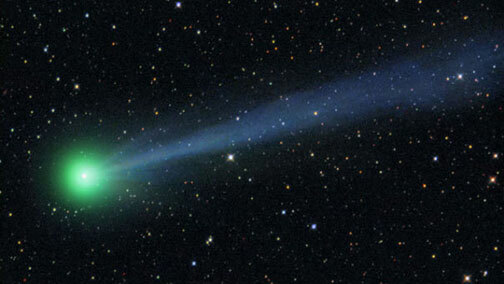 This is the 51st comet to bear comet-seeker McNaught's name. And now ten months later as Comet McNaught is finally becoming visible to the naked eye, an unusual crop formation in beans was reported on June 7, 2010, not far from the Stony Littleton Long Barrow near Wellow, Somerset, England. Australian scientist and crop pattern analyzer, Red Collie, thinks there is a link between the new comet and the new bean formation. Next PostNext Could BP Oil Disaster Threaten Gulf Power Plants?